This is a very different approach to training! When clients engage with In Training, they quickly realize that they have never had this high level of attention, commitment, dedication and experience - you will be amazed by the knowledge, education, and insight that comes with being a client of In Training. What you are really gaining is a health educator, motivation coach, personal fitness trainer, physiologist, and biomechanics/movement specialist, all in one. With over 30 years of success stories, In Training clients continue to enjoy better health, increased strength, stronger endurance, and happier lives! The methods, programs and training help health and fitness enthusiasts excel and improve, and athletes achieve their highest goals. Since the early 1980's In Training has been the premier professional fitness consulting and training business from the Lamorinda area to the San Ramon Tri-Valley. 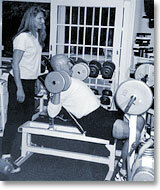 All abilities, beginner on up, have gained specific cutting edge training methods and tools to achieve personal goals. So begin your training journey here. 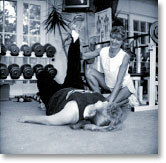 You will be amazed at what your body is capable of with a specialized training program developed by In Training. Step 1: Schedule your complimentary initial session today! Step 2: Assess your starting point with specific tests and measurements through a fitness evaluation. Step 3: Personalized sessions are developed and scheduled. Then your training begins. Option available: join a small group training program. Five to ten session packages available for Pilates Reformer, indoor cycling, hiking, running and strength training for all abilities. Select what's most fun and start seeing results! Now is the time to get started, get trained and make a change! Body Sculpt Starts April 19, 2010. It's time for you to take a new turn. 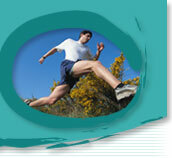 A stronger personal performance level, a healthier lifestyle. Maybe you need to improve your eating habits...develop a more positive attitude about yourself...take control of stress. It's definitely time for some new energy in your life. Whatever it takes, you're ready to make a change. No one works with you quite like In Training. You'll embark on a thorough, thoughtful lifestyle improvement program that starts right where you are today -- imperfections and all! In Training takes into account your fitness experience, activity preferences, time limitations, health status, eating patterns, motivation and personal goals. What you end up with is an intelligent, practical program catered to fit you...and only you. After your orientation and introductory sessions, your program starts to take shape. You should already notice an improved attitude, energy level and the desire to eat more nutritiously. Your body is on its way to feeling better than ever. And that's a change for the better! For over two decades In Training has been the premier fitness consulting and training business from the Lamorinda area to the San Ramon Tri-Valley. Elite Training Systems is the technical side of In Training, with a focus on science based testing and training methods performed in-house. What was once available only to the Olympic and elite level athlete is now available to local endurance athletes, fitness enthusiasts and health minded individuals right here in the East Bay. We use medical grade, state of the art equipment which includes the Sensormedics metabolic cart, YSI blood lactate analyzer, Biospace body composition analyzer, RacerMate 8 person Multi-Rider cycling system, and Go2Altitude intermittent hypoxic training. Specializing in performance enhancement and optimal health status, Elite Training Systems will give you the tools you need to reach your health goals, your fitness potential and give you an edge in competitive sports.